The rediscovery of British cinema is underway. The BBC’s recent series The Lost World of Mitchell and Kenyon was an admirable success. Modules on the native film industry are a staple component of most film studies courses in UK universities. Yet much of British cinema remains “lost” to the popular imagination, non-existent beyond Ken Loach and Mike Leigh, John Grierson, Michael Powell and Emeric Pressburger. The academic discipline has been long overshadowed by Rachael Low’s seminal, multi-volume The History of the British Film. Low’s prejudices and preferences are now being challenged by revisionist film historians. Matthew Sweet’s Shepperton Babylon adds to this current trend. His book combines meticulous research with primary interviews to highlight the areas of British national cinema which are worthy of popular and critical re-examination. Like many explorations, Sweet misses as much as he finds. His chapter selections are esoteric. Sections on the forgotten silent star Lillian Hall-Davies and a reconsideration of the Quota-Quickie films of the 1930s fulfil his theme of rediscovery. However, sections on Michael Balcon and the Ealing Studios retread recent critical attention, while the blanket omission of other areas, such as the Hammer Horror cycle, feels arbitrary. Shepperton Babylon is primarily a work of oral history (1). This brings with it its own difficulties: questions of memory, accuracy, collection and editing, which are never adequately addressed. However, interviews with forgotten players bring colour and vibrancy to this study. While Victor Perkins asserted that, “British cinema is as dead as before. Perhaps it was never alive” (p.5), this human history tries to breathe life into the corpse. Sweet carefully treads the line between academic tome and popular history. He quotes Robert Manvell, who likened British pictures to “faded leaves painted in exquisite detail by a lady in Cornwall” (p. 5). British cinema has been described as a “cottage industry”, lacking the glamour, scandal, or personalities with which the public can engage. Sweet’s title is a clear nod towards Kenneth Anger’s Hollywood Babylon (1975), and while lacking Anger’s tabloid revelations, Shepperton does attempt to rediscover some of these “lost” personalities, places and scandals. Sweet recounts the career of Lillian Hall-Davies, one of Alfred Hitchcock’s silent stars in 1927, who took her own life in 1933 having failed to make the transition to the “talkies”. Sweet’s enthusiasm and journalistic style make Shepperton Babylon immensely readable. However, he does occasionally slip into hyperbole: George Formby looks like a “human being reflected in a tap” (p. 136). This “vitality” was often grounded in the music hall tradition, with low comedic elements, as producers did not have to worry about export and the Hays Code. While Sweet acknowledges that many associated with Quota-Quickies expressed disdain for them, his interview with producer Anthony Havelock-Allan, a Quota producer in the 1930s, highlights their positives. The exhibition of Quickies exceeded the Quota requirements, suggesting popular appeal. Havelock-Allan argued that the Quota-Quickies offered low-budget training to a generation of British film makers: David Lean, Terrance Rattigan, Robert Morley. Sweet’s case-study focus necessitates the omission of some influences, but it is disingenuous to ignore the impact of foreigners on British cinema. While Alexander Korda plays a part, there is little acknowledgement of foreign workers who added to the vivacity of British films: Joseph Losey is mentioned only in passing; others not at all. The influence of Hollywood from the beginning of the 1930s, along with the impact of émigrés, cannot be so conveniently ignored. In When Hollywood Loved Britain (1999), Mark Glancy notes that the “British” film (a film which imagines a cinematic Britain) was often created by those who originated outside of British shores. Indeed, perhaps the most “British” film of the 1930s, The Private Life of Henry VIII (1933), was produced and directed by the Hungarian Korda, set-designed by his brother Vincent, scripted by their countryman Lajos Biro, while the cinematographer was Frenchman Georges Perinal. The influence of foreigners on the industry was equally as important, and perhaps equally as “lost”, as that of native workers. Indeed, overseas influence, particularly in terms of film finance, remains crucial to the British industry today: Working Title is backed by Universal and Canal-Plus. Even the formerly independent Aardman Animations, with their Ealing-esque sensibilities, have had to endure flying visits from Dreamworks executives. The success of the book is Sweet’s ability to connect with the films, histories and personalities which have been so long forgotten. Despite the omissions, Sweet is to be applauded. While by no means comprehensive, his study is passionate, accessible and well-researched. While those who explore such a “lost” world are bound to make mistakes, Shepperton Babylon provides proof that such journeys of rediscovery are worthwhile. 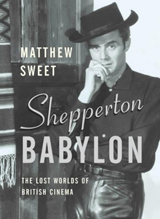 Shepperton Babylon, by Matthew Sweet, Faber and Faber, London, 2005. Shepperton Babylon was reconceived as a clips-and-commentary documentary for BBC 4. While perhaps lacking depth, the film provides an excellent introduction to British National Cinema, and makes a useful teaching aid.